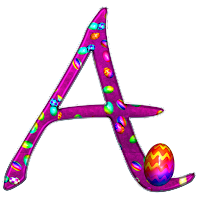 Welcome to this year's Easter Treasure Hunt Blog Hop, the biggest one yet! I was so pleased as more and more people signed up for the Hop this year. I am sure there will be some new blogs for everyone to discover as well as some firm favourites from previous years. Each blog will feature a letter which will spell out the mystery phrase, the first line of a poem this year. Don't forget that some people will post later than others because of time zones. Come back here at the end and leave a comment telling me what the mystery phrase is. I have enabled comment moderation so the answers will not appear for two weeks. Closing date is Friday 13th April. How auspicious! Don't forget that everyone who enters gets another entry into my Five Peaks Blog Hop Challenge this year! The fabric was a RAK from Tiff and is a little bit more acidic than in the photo, It's a Chromatic Alchemy Belfast called Marie's Daffodil. I will be stitching this for the next four days so will have something nice to show you hopefully on Easter Monday. The project bag was a gift from Lisa the Inspired Stitcher. It is the only frog I want near me! Finally, there will be a new Blogger of the Week post up later today so don't forget to go and visit to see who it is. I will also be announcing the winner of the competition we hosted there recently. Pretty ` Spring in the Square´ piece Jo, and the other Just Nan embroidery too. I am going to see what everyone has stitched for this hop. Happy Easter. Ooh, looking forward to seeing what you do with that lovely yellow fabric! Looking forward to seeing what you are stitching on your new fabric! Where are my sunglasses! That is stunning yellow.I am wating to see it appear in a project too. I love the Just Nan seasons they look so cool. I can't wait to see what masterpiece you create on that bright fabric too. Happy Easter, Jo! Glad to see you still use the project bag. Love a good Just Nan too. Happy Stitching! Pretty Spring stitching, Jo! I look forward to hopping around today :) Happy Easter to you! I love seeing your just nan pieces. The colors are always so pretty. Happy Easter! My answer: April air stirs in willow leaves.....I'm missing a few letters still but thought I'd throw this in! I love Just Nan patterns, and have two currently that I hope will fit in the lid of a pretty box I found :D I also love Chromatic Alchemy's fabrics..very bold colors which makes me clap for happiness! haha! Hi Jo! I love looking at your stitching, your spring Just Nan piece is so pretty! Looking forward to see what will appear on the bright yellow fabric!! Thank you for all your hard work putting this blog hop together, as always it was so fun to hop around and see what everyone is stitching on! I'm going to email my guess since previous folk's posts have appeared and I have a guess at the mystery phrase! Wohoo I can't wait to hop along. I'm so glad you got so many wonderful people joining in this time. I'm off to do the hop. Love your Spring finishes and your nice RAKs. Can't wait to see what you have planned. "April's air stirs in willow leaves." That's definitely a looooong blog hop. And a lot of fun. Such lovely spring stitching, Jo. And that yellow fabric looks great. I'm very curious to see what you will be stitching on it. Thanks for organising such a fun blog hop. I'm about to do it all again as I got so focused on collecting letters that I forgot to leave comments. The phrase is: April's air stirs in willow leaves. Sweet Spring stitching Jo. Whew! What a Blog Hop! April's air stirs in willow leaves. I had never heard of that before! Well done Jo! Thank you for another splendid Hop!Happy Easter! Answer:. April's air stirs in willow leaves. Pretty finishes and I love the yellow fabric. Just about got to the end of this Easter hop, although I must go back and leave more comments. Some lovely stitching and patterns to be seen. The phrase seems to be - April´s air stirs in willow leaves - Great fun as every year. Lovely Spring Stitches! Thank you once again for organizing the blog hop and motivating me to stitch Easter themed ornaments!This way I try to find free patterns (really free not stolen) to stitch as my magazine stash has not got any other Easter patterns.I made them all LOL! So the phrase is " April's air stirlin willow leaves". I guessed the l as there was one blog that hadn't posted.Should there be a g in stirling?It is a poem I don't know so hope you let us know who's the poet.I'd love to read it. Anyway hope you have a great Easter!AriadnefromGreece! Fun hop seeing all the different projects. "April's air stirs in willow leaves"
I did it! "April's air stirs in willow leaves" and I looked it up to discover it is the beginning of a haiku! Very clever and I learned something! Thank you Jo! Thank you Jo for a really fun blog hop! Thoroughly enjoyable! I was so neat to see everyone's projects! And your stitching it gorgeous as usual! What a great blog hop, Jo. Happy Easter, my friend. Wow, this one was a nice, long hop! And there were quite an abundance of Mill Hill's this time around hah. I think the phrase is: "October's moon shines so brightly"
But in case that's not exactly correct, I suppose I could guess "April's air stirs in willow leaves" Maybe I should've stitched a butterfly to end the hop! Jo! The Hop was such fun! I really enjoyed hopping around to see everyone’s stitching. Thank you for organising us all again! The line is “April’s air stirs in willow leaves”. Happy Easter! Thanks for hosting and love seeing the finishes and glad the fabric arrived safely. I think the secret phrase is "Aprils air stirs in willow leaves"
I'm playing catch up... will I see what's on the yellow fabric .... or will i have to wait till next time i'm here lol. 3 people haven't posted just yet but I'm able to make a guess. April's Air Stirs in Willow Leaves. This was so much fun. Thanks again for hosting. Okay, and the phrase is..."April's aim stirs willow leaves". Thanks again for a fun hop! I found the mystery phrase... April's air stirs in willow leaves. Looking forward to the next challenge! Thanks for another fun year, Jo! "April's air stirs in willow leaves" except around here it seem like April's air is bringing snow! April's air stirs in rillow leaves. Lovely JN piece (garden), and the Spring sampler. Enjoyed the Easter Blog Hop again this year. April's air stirs in willow leaves. Thanks for hosting another fun event! First of all, thank you for organizing the blog hop, it is the first time I participated but I enjoyed a lot. "April's airs tirs in the willow leaves." Another great blog hop, Jo, even if I only finished it today. I think the mystery phrase is "April's air stirs in willow leaves". Looking forward to seeing what you stitch on your yellow fabric. I know I'm late to the party again, but this was a fun experience. The phrase is April's air stirs in willow leaves.